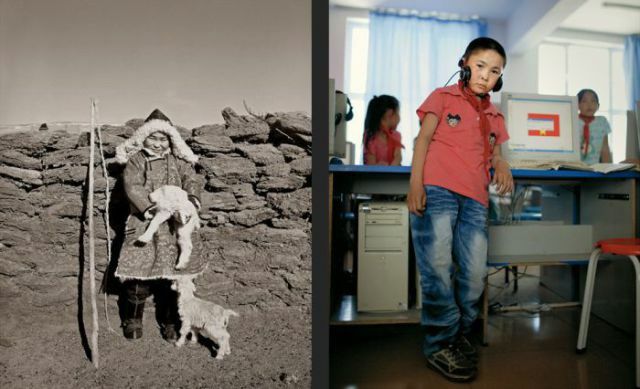 These are some photos of some children from Mongolia then and now. The time span is only two or three years but what a difference. 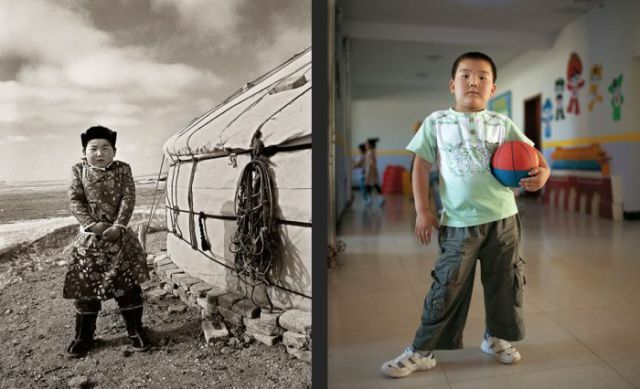 These children represent just how fast the world is changing. they got a new camera awsome ! I find that sad. Occident goes everywhere. 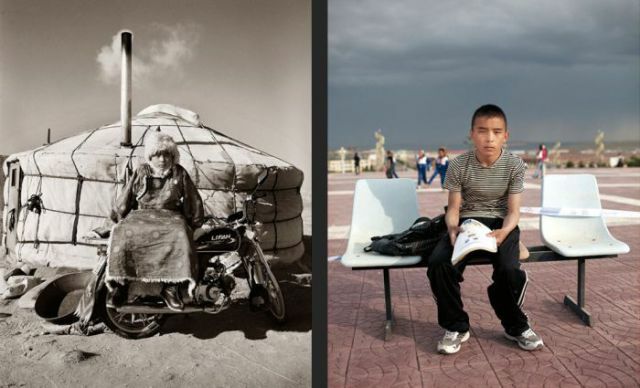 At first i was surprised to see picture of Hu Jin Tao in the background, be cause it would've been bizarre if you see picture of Chinese in Mongolia. 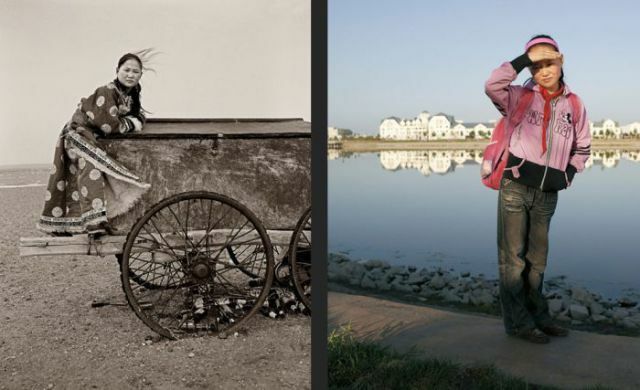 Then i realized that those pictures are from Inner Mongolia which is now part of China. Hoping to see reunification of all Mongolia in this century. The world is changing with the same pace in all part of the world. I hate the "loss of culture" point of view... You would rather them die of hunger and disease but with their, oh so important, culture? There is more to culture then living in yurts and drinking oxen milk - do not be shallow.. Things change as they should, let go of the particularities that divide us, and let us again believe in universality. Multiculturalism is a sham, designed to keep us apart as we toil for the rich few. Now, interculturalism is another thing, but that's a whole different story..
but one thing. Old picture is always in winter. New one in summer. If old was in summer maybe difference is not sa big? Good point, leon-san. Perhaps it is the winter clothing making them look steeped in another era. It's some picture from Inner Mongolia. It's not all Mongolia. Mongolia is a individual country of the Asia,its population is 3 million. The capital city is Ulaanbaatar. Here is some mistakes. 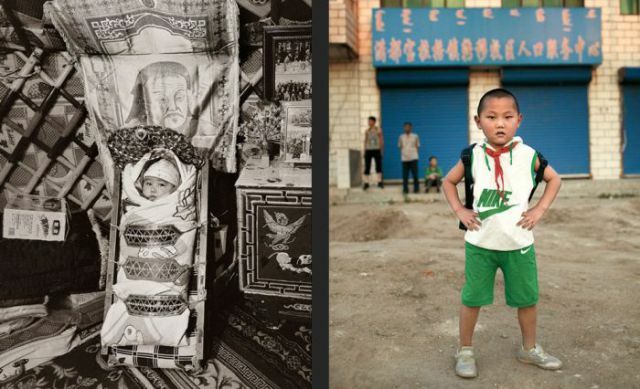 I suggest you to change the title of this post to Inner Mongolian Children Before and Today. You goddamn idiots. It's Winter in the first shot and Summer in the second. Of COURSE they're going to be wearing their big, warm Winter jackets in the black & white photomanipulated version. You've all been had. Also, there is a gigantic satellite dish in the first shot in #11. How uncivilized, eh?